Computers are really good at calculation. Well... they are computers after all, right? But how do they know what "addition" means? We had to find a way to be able to give them two numbers, and to get their sum as a result. We're going to see what computers actually do when we ask them to perform an addition, and we will even build our own circuit that adds up integers of any size! We are going to use (virtual) logic gates, because they are a nice way to abstract ourselves from the transistor level and use logic operations directly (logic gates can easily be made with transistors). They will allow us to reproduce with a good accuracy the way computers work and how we can help them to count. The way a logic gate works is pretty straightforward: we give some input(s) to the gate ( wire with or without electrical current ) , and the gate gives as an output in the form of electrical current too. This one is really easy, it takes one input and returns the opposite: if the input is positive the output will be negative, and vice versa. Nand gates (and NOR gates) are functionally complete, which means you can build any logical circuit using only such gates. We won't be using them, but it's nice to know that we could use only NANDs to get any kind of logical operation done :). The first circuit we will build is called a Half Adder. It will allow us to give two inputs to the circuit, and get the result of their addition, in binary. Our circuit will have two outputs, and we will use one of them for units , and the other one for the twos . you can see that the result will be the sum of A and B. Now if we take a closer look at the outputs, we can see a recognizable pattern that we saw with some gates we talked about: indeed, the unit output corresponds to a XOR operation on the inputs , and the twos output corresponds to an AND operation! You can play with the inputs to check how the signal is modified and it's effect on the outputs. If both outputs are on then the twos output will be on, and not the unit one. Awesome, we can count from zero to two! Well all right, I can understand if you're not convinced yet. But billions and billions are almost there! Now we need to step back a little bit. We have our great half adder, it does it's job pretty well: adding two bits. But what about larger numbers? We will want to add other numbers, and we need a more general kind of circuit for that. and if all three inputs are on, then both outputs will be on. 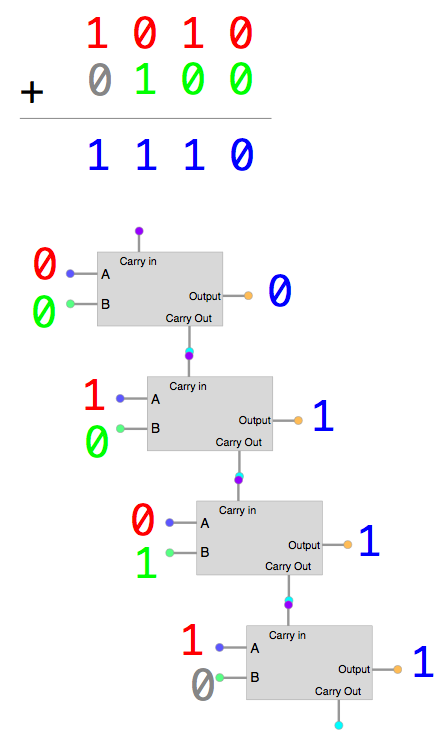 To put things in another way, the core of the Full Adder is the inputs A and B , and the unit output. And then, the Carry in and Carry out are there to allow the chaining of several adders: that's how we can calculate numbers larger than two. And this is exactly what the Carry inputs/outputs are going to do for us. each Full-Adder will take care of one order of magnitude in the operation: in other words, each Full-Adder handles the digits of one column of the addition, taking the carry (if needed) from the previous column, and sending it's carry (if there is one) to the next column. Okay, it's time to get it done. You shouldn't even really look at it actually, that's a lot of numbers everywhere. To achieve this result, we will need two Half Adder ( who would have guessed? :) . I will not discuss the logic of it, because it is pretty straightforward and way easier to understand by playing with it and studying the diagram. Here it is, our magnificent Full Adder! With one full adder we can't achieve much more than what we could do with one half adder. Finally we can start to add up bigger numbers. 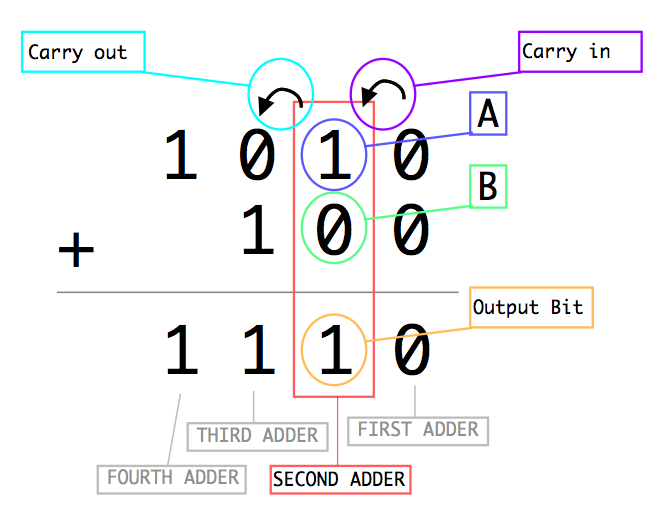 With a 4 bits adder, we can deal with numbers up to 1111 (binary), that is 15 in decimal! The thing is taking quite a lot of space, but I still want to be able to see the path of each wire for this one, so I put the adders in a diagonal way. You can zoom on it, it will still render nicely. The corresponding additions are written under the circuit, both in binary and decimal, so you can easily see what is happening. The leftmost inputs represent the first number to add, and the rightmost ones the second number. Now that we have done that, we can build circuits of the size we want, that will be capable of adding any integer, for example a 64 bits Full Adder can handle numbers from 0 to 18,446,744,073,709,551,615 !